What war means today: Homeless Plymouth People Live by the Roadside. They are refugees from raided Plymouth. They have no homes to go to by day. They have no shelter they can trust by night. While it is light they sit around in Rest Centres. Before it grows dark they trek out to the countryside, to sleep in lorries, in lanes, in farms. Even the old. Even the women and the young children. The story of Plymouth is a warning. It is a warning to high authority. A badly blitzed city is not a city any longer. It is a danger zone. It is a place where earthquakes have happened. Help - of every kind - must be rushed there. It is not enough to praise the courage of our people. We must help them. "Tonight some of the city's streets are nothing more than a desert of dusty rubble. They are streets that the citizens leave for the countryside when night falls." So wrote the Plymouth Evening Herald on May 1. And the Western Morning News: "Most of those who go out on to the roads are women, women with children, women with bundles of goods. There are few men, and those who leave the city are mostly old. Often they have been refused shelter for the night. Yet they have not lost their spirit." Each evening, before nightfall, they leave P1yrnouth, without haste, without anxiety. No cries, no panic, no clamour, only people moving out of the streets, along the highways, towards the countryside, away from the city. 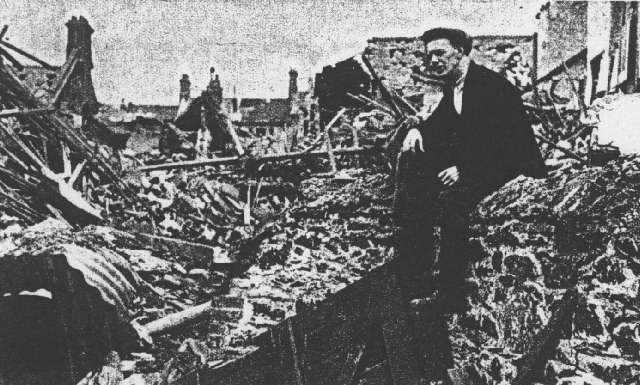 "AFTER THE BOMBERS HAD PASSED"; The Widdicombe home is destroyed. Mr. W.H. 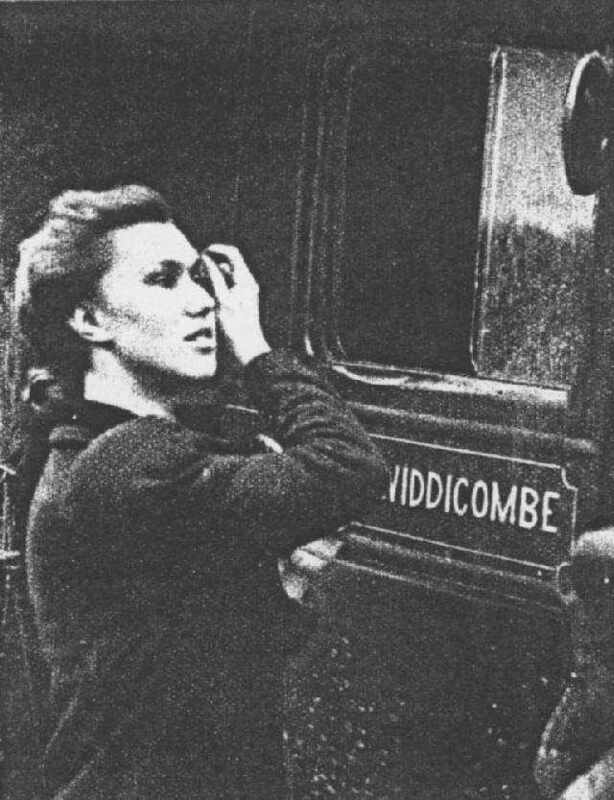 Widdicombe was just a coal merchant going about his business. Now his home has gone. His business has gone. Patiently he salvages what he can to start his life again. "HOW THE DAYS OF A ONCE BUSY MAN ARE SPENT"; His wife sits in the Rest Centre. His children play round the Rest Centre. He walks the street, talks with his friends. They discuss the raids, their losses, the future. Some carry bundles of blankets. Some carry suitcases. Some carry nothing at all; they travel light: they are the hardy ones. At certain points they gather to board the lorries. Some are lorries run by carriers. Some are lorries run by coalmen. Some are lorries stopped by kindly policemen who take the law into their own hands, and urge drivers to give the refugees a lift. So they pile on, with their kiddies and their bundles and their thermos flasks. The children dangle their legs over the tailboard and laugh. The boys wave to the girls in the lorries they pass. The neighbours crowd together on their bundles and chatter. It is like going to a fair. Only now and then a child stops laughing and turns to look at its mother for reassurance. 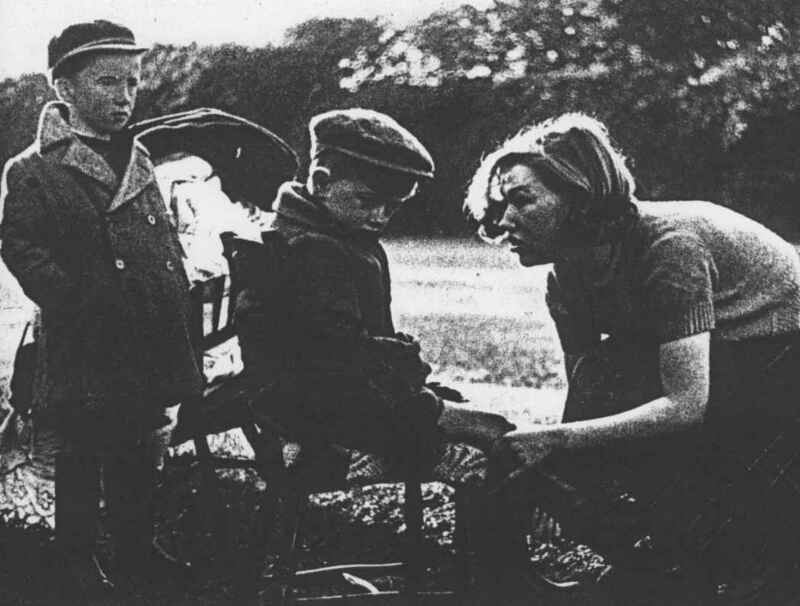 Now and then a boy stops waving to spit moodily towards the flying hedgerows. Now and then, in the middle of telling a joke, a woman's eyes fill with tears, and her voice fails her. The lorries split up and scatter here and there over the western countryside, and one by one they pull up, and the passengers alight. Many are homeless. Others have homes which are damaged. They all join in the tramp to the country. 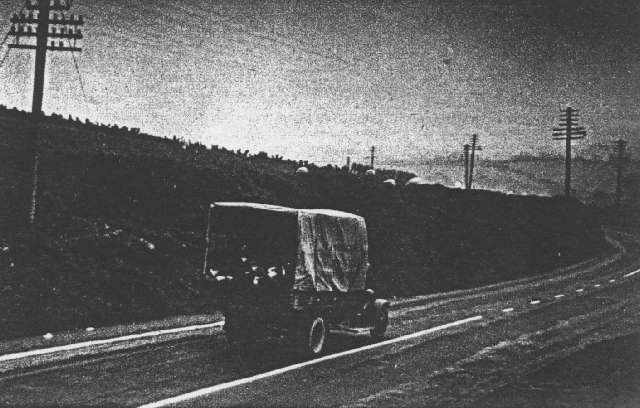 And out there in the countryside, sheltering for the night from the bombs, one truck-load of families becomes one family, and that family in turn merges with all the homeless families in a whole convoy of trucks. People who lived in the same street for years and never spoke to their neighbours, speak now. New friends are made, new children petted, a whole new community is established there in the countryside at nightfall They sit in circles - some have brought chairs with them and quietly talk of their homes and their tragedies and their future - especially they talk of the future - while the night gets darker and the air colder. And when at last a man stands up and yawns, and says: "Well, good-night all," a score of new voices answer: "Good-night, boy," as if they had known him all their life. One by one the families turn in and the countryside is quiet, the lanes and farms are silent. And the bombers pass overhead again, and their noise fades in the distance, and, perhaps, those who cannot sleep see on the horizon towards the city that they have left, again, again, again the first streaks of the nightly fires they know so well, and from which they have fled, the fires that withered their homes and wrecked their streets and swallowed up their livelihood. 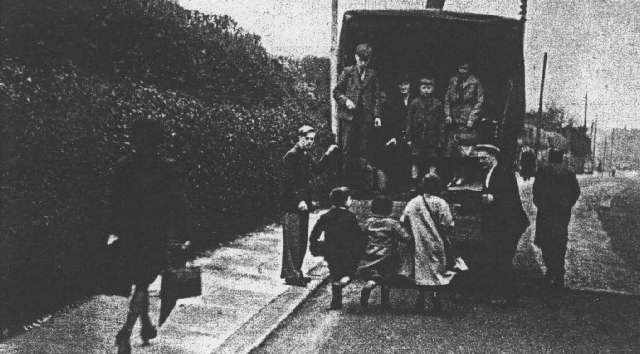 MR. WIDDICOMBE DOESN'T COMPLAIN - BUT HE "DOES SOMETIMES WONDER"
"THEY CRAM IN EVERYONE THEY CAN"; Mr. Widdicombes lorry is full. His family is in it. So are the strangers he picked up on the way. Only a few weeks ago these people were not here, had not dreamed of sleeping out in the countryside. Then they had slept "like proper people" in their clean beds in their little rooms in their flat-faced homes, and those who remarked what a fine night it was had not thought that the sky would make a perfect backcloth for bombers to scatter such fire and violence and death along the roadways, and through the suburbs and across the city from end to end. Now they remember their first terrible night, and the night after that, and the night after that again. They remember it coldly, without drama, like that man - a greengrocer, he was, who had lost his shop - who told me, as casually as if he were discussing the price of potatoes, how the two ends of his street were ablaze and his front door blown in, and his family scared to run out of the house because such a lot of H.E. 's were coming down. Out in the street, perhaps drunk, perhaps not, some soldiers and sailors were running about, singing and laughing and swapping hats. Then one man, a soldier with a sailor's hat, had fallen into the doorway and the greengrocer had knelt by him to explain that he wouldn't be able to do much for him, as the soldier's arm had been blown off. But as he knelt, he saw there was no face under the incongruous sailor hat, so he called to some soldiers in the street, and they found a board and came and took the body away. "THE FAMILY PREPARES FOR BED"; EVERYTHING IS PUBLIC NOW. Their home is the lorry. Take up the blankets and it is a sitting - room. Lay down the blankets and it is a bedroom. 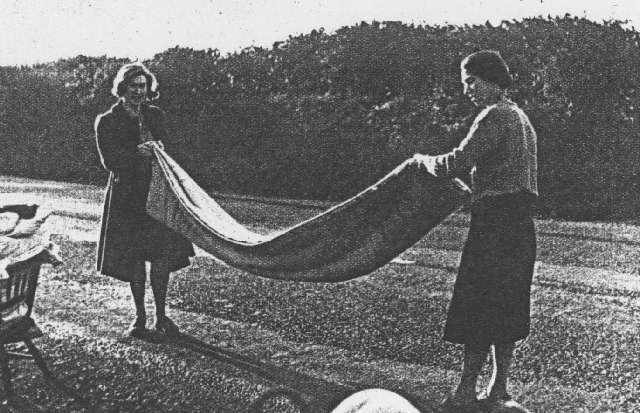 Now the blankets are down and Leslie Widdicombe is got ready for bed. "HER LOOKING GLASS - THE DRIVING MIRROR"
"THE WIDDICOMBE FAMILY MAKE THEIR BEDS BY THE ROADSIDE"
"SLEEPING QUARTERS FOR A PLYMOUTH FAMILY"
And they remember the mornings, when the dust hung over the ruins like a fog, and every where in the ruins the dusty rescue squads were digging and digging to get the people out. And after the dust had settled, the acrid smell of brickdust and plaster and damp burnt paper still stayed. Even out in the country, weeks later, that smell sticks to their pillows. And in the market place a woman - she was the only stall-holder there at the time - told me: "It's that smell that gets me down. That dead smell. If my house gets that smell I believe it's done for. I do everything to keep it out - burn those incense cones, cook meals that smell good - but I can't keep it out. My house is beginning to get that smell, and I believe it's done for." The people sleeping in the countryside know they'll have that smell around them again when they go back into town in the morning. They know what they will see then, realities that make the fantasies of surrealism seem commonplace: buses blown on to the roofs of houses, a tree hung with women's clothes, the huge tinted photograph of a Boer War soldier, with waxed whiskers and an enormous medal, which hangs alone with glass unbroken on the enormous wall of a house, whose other walls have entirely disappeared, so that no one can even guess their geography. When they go back to town in the morning, these people will pass all this without a glance. These are familiar sights now. They do not seem fantastic. Those whose streets are not blocked with the "Unexploded Bomb - No Entry" sign will pick over their belongings, will salvage what they can out of the rubble. They and the other homeless people will get their meals from the Queen's Messengers or at the Rest Centres. The women will worry about how they are going to get changes of clean clothes for the kiddies, and how if only they could have saved a few pots and a primus, everything would have been different. 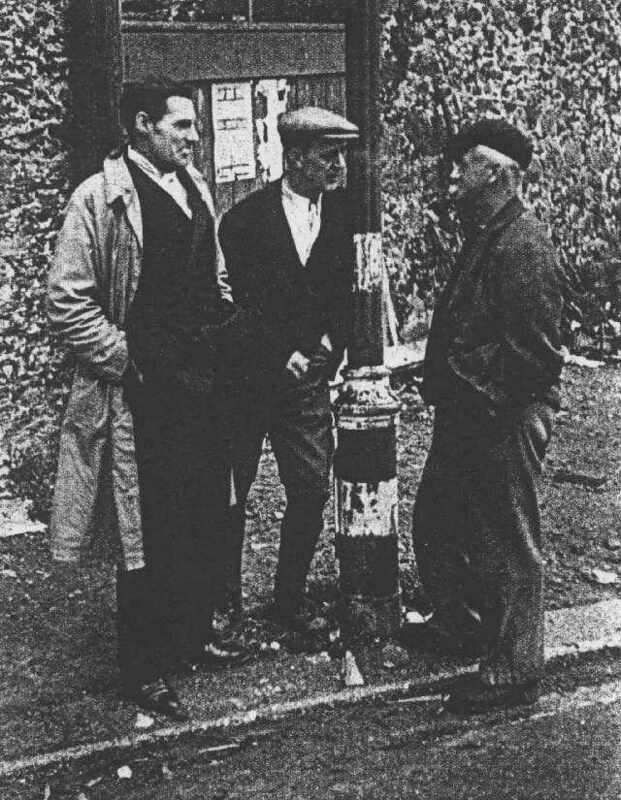 The men will walk about the city, with their hands in their pockets and their heads down, trying to work out how they are going to make a living for themselves again, now that their shop is burnt, their tools gone, their pony and cart bombed to smithereens. "THE WIDDICOMBE FAMILY TAKE THEIR EVENING MEAL"; Out in the country lane all is peaceful. The children have played in the fields. Father has sat reading the paper. Now they have their evening meal, a meal out of paper packages and thermos flasks. All is quiet. To-night - the storm may break on Plymouth as it broke before. "HER DRESSING TABLE - A PILE OF PILLOWS"
And back in the Centre, the children will keep asking: "Where are we going to go, Mum ? When are they going to move us?" And their mothers will answer, "We don't know. Go on out and play." Yet the facts are simple and damning. Fifteen months ago, Plymouth asked in vain to be made an evacuation centre. Less than two months ago, after a heavy raid, they asked again and were refused. 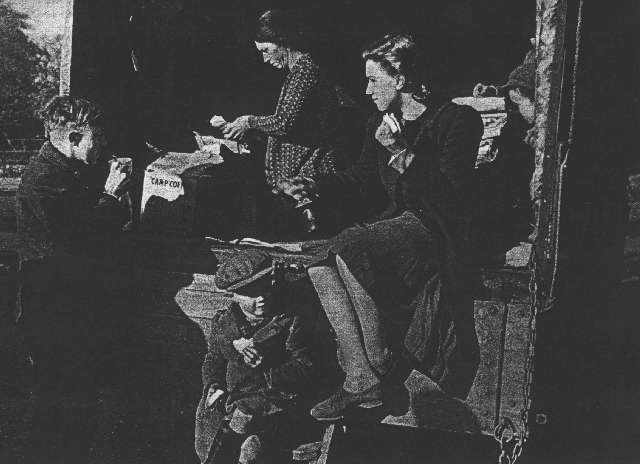 Then, but only after five more nights of concentrated bombing, some parts of the city were made evacuation areas, and the first few little groups of children began to leave for new-found homes. The line is drawn as authority happens to decide. One street is taken and another left. 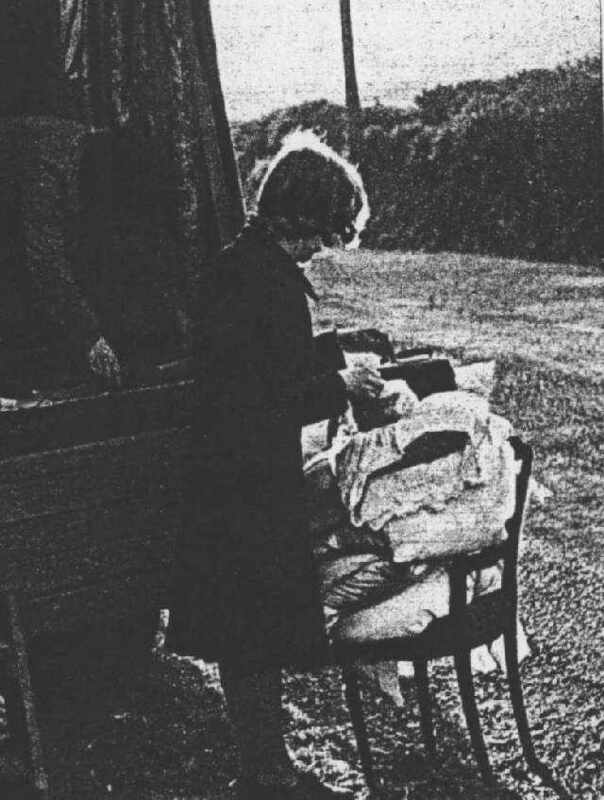 Small wonder that the refugees out in the countryside speak bitterly, in the night times, of the red tape and incompetence which had prevented any scheme being put into operation immediately, of officialdom which had neglected even to have registration forms ready, who have only arranged for a tiny fraction of the city's 20,000 children to be evacuated. 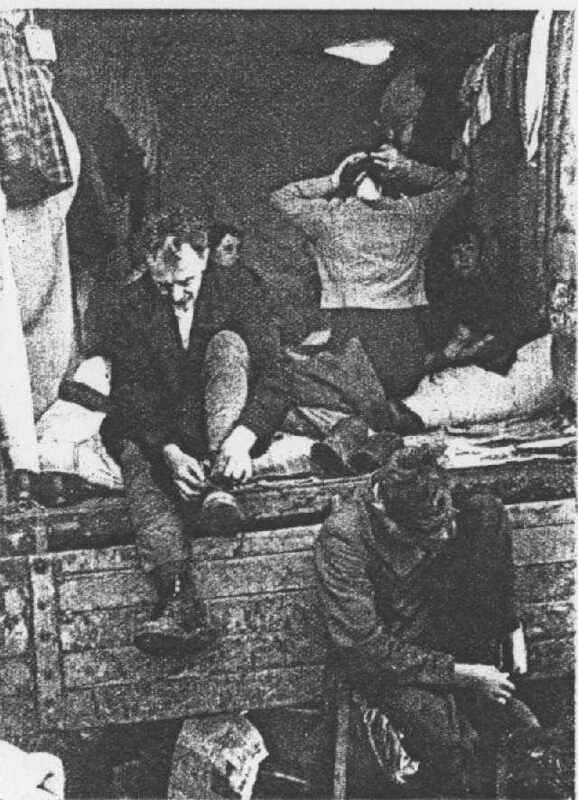 And even now, as they point out, no solution is offered for the problem of those men who work in Plymouth, who must live in Plymouth but who have no adequate shelter to go to when the bombs begin to fall. 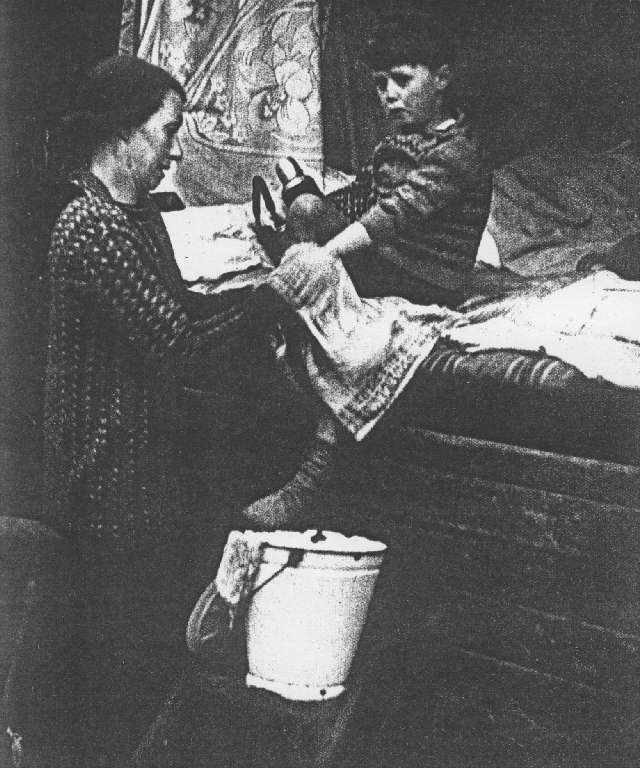 It is a warning to authorities that these are the things which they talk over out there in the countryside, where the people snuggle under their blankets and can still hear the wind, the same wind that blows.through the bombed city streets and flutters the ragged black-out curtains in the broken windows of the homes that will never be homes again. This was written by a Picture Post reporter in 1941 after the heavy raids on Plymouth and Devonport, *all due acknowledgements for text and photos....what a piece, what an essay on our history, or rather MY history. My mother drove an ambulance through the air raids, and as a boy I played on the "bomb sites." It is my history. it is mostly complete but some photos are omitted as my copy is poor.